Familiar with the idea of the self-fulfilling prophecy? Robert Rosenthal is best known for his research and studies conducted on experimenter expectancy effects. Thisis the influence that a researcher can have on the outcome of an experiment (“Rosenthal’s Work”, n.d.). Even though they were all standard lab rats and not specially bred one way or the other. The results of the study illustrated that the students unconsciously influenced the performance of the rats in order to fit the expected results between the “maze bright” and “maze dull” rats (“Rosenthal’s Work”, n.d.). Thus, Rosenthal would rationalise that the same effect would occur with teachers and students. The conclusions demonstrated by the study greatly illustrate the Pygmalion effect, or Rosenthal effect, which is the phenomenon that explains better performances by people when greater expectations are put on them (Bruns et al., 2000). For example, the teachers in the study, may have unnoticeably given the supposed academic bloomers more personal interactions, highly extensive feedback, more approval, and kind gestures, such as nods and smiling (Spiegel, 2012). On the other hand, teachers would generally pay less attention to low-expectancy students, seat them farther away from teachers in the classroom, and offer less reading and learning material (Bruns et al., 2000). 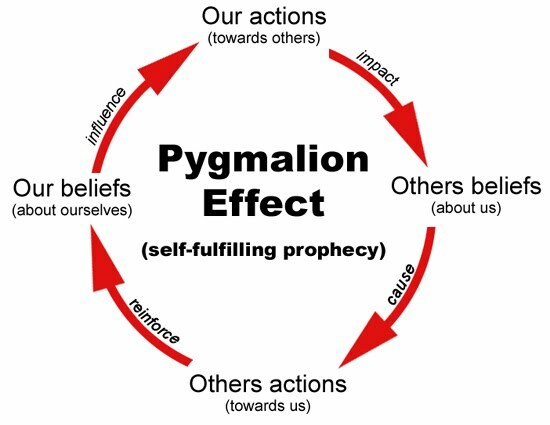 Examine the flow chart above and watch the videos below for more information on the Pygmalion effect.